An image from 10 December 1900. According to the library caption: "Showing the steamer Hirere (48 tons), built in 1896 by C. and W. Bailey at Auckland for the Clevedon Steam Navigation Company Limited of Auckland, being launched on 3 December 1896. She was later purchased by the Devonport Steam Ferry Company Limited and employed in the Auckland-Howick-Whitford run. 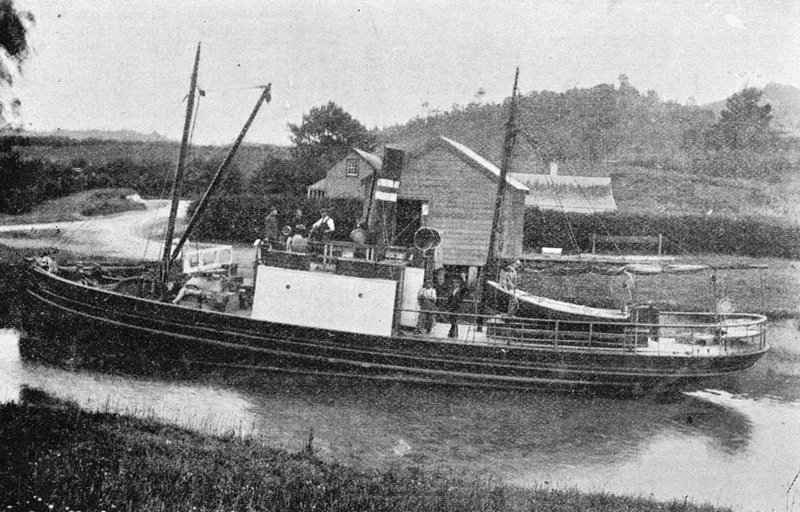 Sold to McCallum Brothers Limited and converted into a tug. Register closed 1930. This photograph taken in the Southern Wairoa River." (7-A15642, Sir George Grey Special Collections, Auckland Libraries). The Hirere's story did not end there, however. Early in January 1930, she was sold to R Russell Ltd, and refitted as an oyster dredge for Bluff. The small steamer Hirere, which has been engaged in various passenger services from Auckland to Gulf ports for many years, has been sold to a Bluff firm as a fishing boat. After a long spell of idleness, the Hirere was recently chartered by her owners, Messrs. McCallum Bros., to Captain J. Jackson, who inaugurated a service to Surfdale. This summer Captain Jackson hopes to purchase or charter another vessel to maintain the service. Carpenters are now working on the Hirere at Julian's Wall. Her new owners intend to fit her out as a fishing boat at Auckland before taking her down to Bluff. The NZ Maritime Index notes that she was still in service in the Bluff fleet in 1966. According to a Rootsweb page, the original Hirere ended up in Northland, of all places, at Shipwreck Bay, "named with the sinking of ships including the 1863 paddle steamer Favourite built in Australia in 1863 of 59 tons, sank on 1st April 1870 after going ashore on Ahipara beach during a gale which is still visible in the low tide surf. Ahipara is located at the southern end of the 90 Mile Beach. Ahipara, just 14 kilometres south of Kaitaia. The remains lie in Shipwreck Bay south end of Ninety Mile Beach." Another Hirere is in service in Northland, built in 1969.